Today we’ll be reviewing one of Cooler Master’s latest mechanical keyboards, the Cooler Master Masterkeys Pro S to see exactly where it excels and where it falls short. 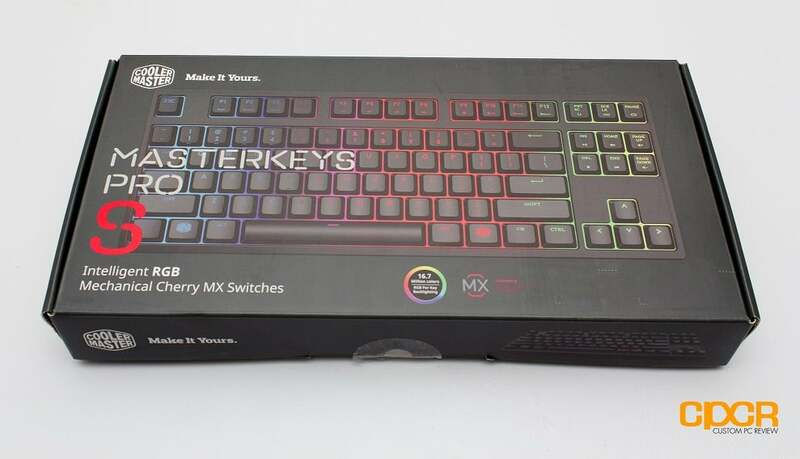 Here’s a look at the packaging for the Cooler Master Masterkeys Pro S.
As it’s a keyboard, included is the keyboard, a detachable USB cable and a field manual. It’s highly advised to save the manual for reference as you’ll see in a bit. The keyboard packs a ton of extra features and most of them can be accessed without having to install the driver software. Via the keyboard itself, up to four banks of macros can be saved directly into the board, with the RGB backlight color mixer placed conveniently on top. Cooler Master has also included a repeat rate adjustment which change the speed at which keys repeat when you hold them down. Of course there’s also the Windows Key lock to prevent accidentally bumping into the Windows Key while gaming, LED lighting pattern switcher, and macro programming. Our sample of the Cooler Master Masterkeys Pro S came with Cherry MX Blue switches however, it’s actually available in a trifecta of switch colors including Blue, Brown, and Red. Stabilizers for the longer keys are handled by Cherry stabilizers. 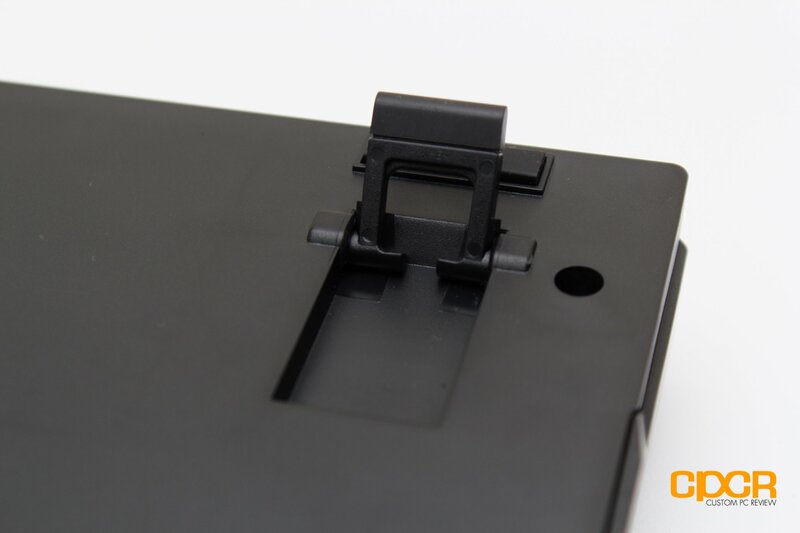 Along with the rubber feet at the bottom of the keyboard, the elevator feet have rubber hats to keep them from slipping as well. 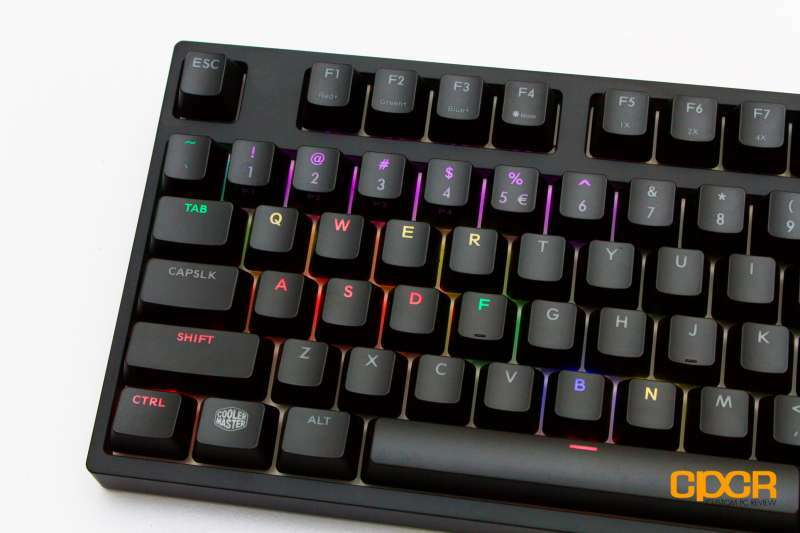 The Cooler Master Masterkeys Pro S supports a myriad of LED lighting options which can be programmed through the driver software for a custom look or you can also choose from the pre-defined patterns. Cooler Master’s software is very basic, offering just the functionality of LED lighting controls and importing/exporting your profiles. This does mean it’s got a tiny footprint though as the software is only 13MB in size. 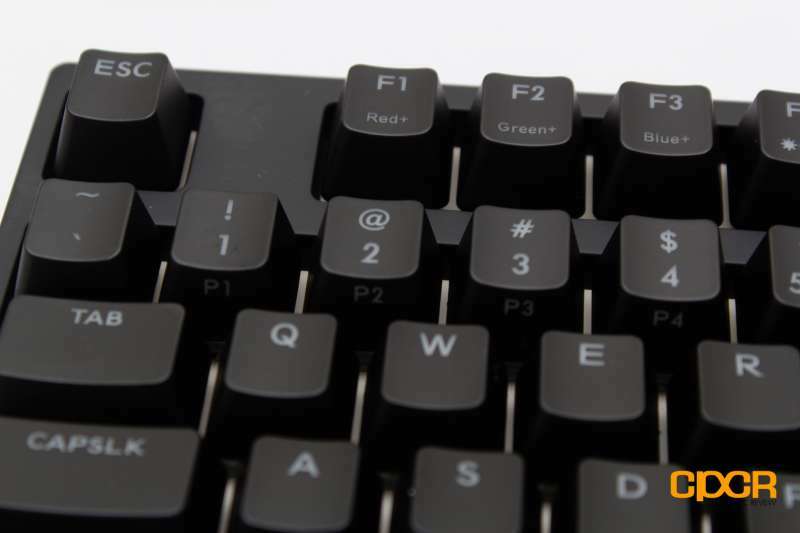 For most of Cooler Master’s gaming keyboards, they’ve stuck to using Cherry MX switches. The Cooler Master Masterkeys Pro S is no different with choices of either Cherry MX Brown, Blue, or Red switches offered. Thanks to Cherry’s excellent product consistency, performance in our Cherry MX Blue sample was excellent as expected. 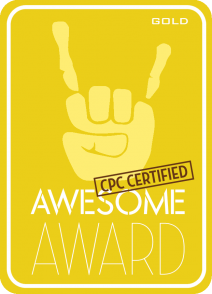 The keys were very consistent, the actuation was crisp and the switch overall felt very good. 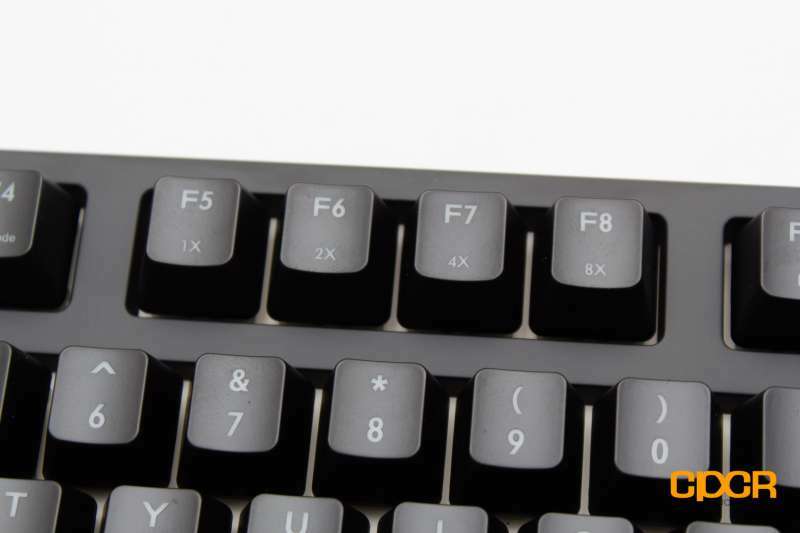 Further, the Cherry MX stabilizers used on the Masterkeys Pro S were excellent as well. In testing, they were quiet, smooth and well lubricated which in turn provided consistent actuation force between the longer keys and the regular keys. As the driver software for the keyboard is lackluster, macro functionality must be done directly using the keyboard itself. While this saves the bloat of having the software taking up too much disk space, configuring macros can also be very confusing for a first timer. Thankfully, Cooler Master includes a detailed manual that guides you through the processes, so definitely keep it to save some hair pulling. NKRO works well as expected. The numpad number key lit up for some reason despite the keyboard have no number pad. It’s likely to have been tied to the enter key since it serves the same function. 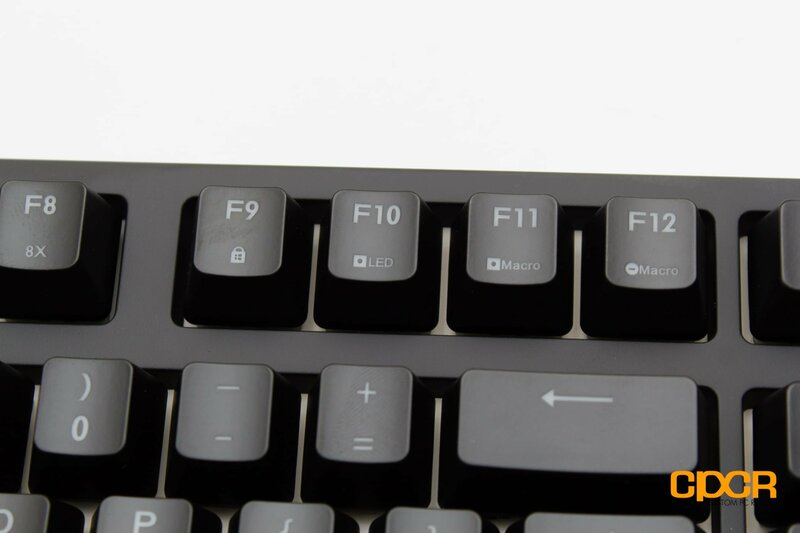 After collecting years of feedback, Cooler Master has seem to have figured out that the best selling keyboards may just be the ones that do the job and look cool without trying too hard. For the most part, the Cooler Master Masterkeys Pro S is a success. With three flavors of Cherry MX switches sewn into a metal backplate, the keyboard is as durable as it is satisfying to use while the brilliant RGB lighting injects a bit of life into the otherwise boring chassis. 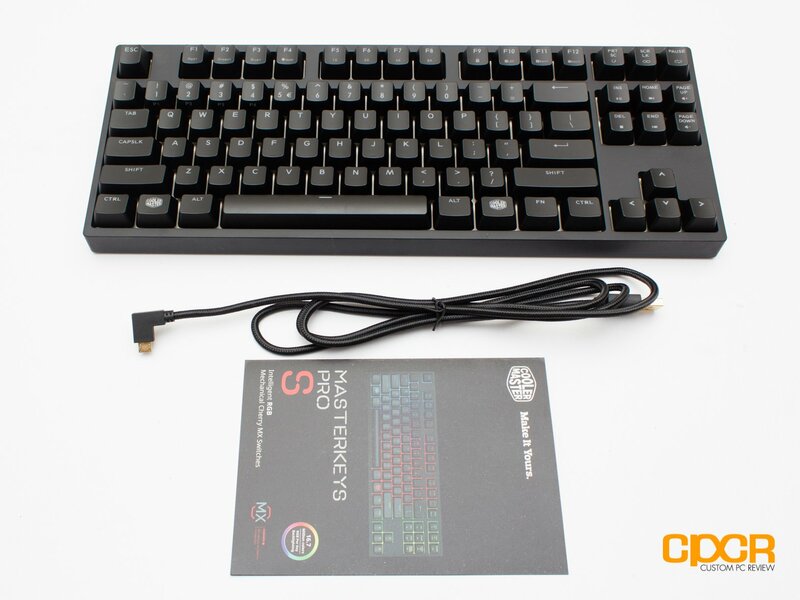 The Masterkeys Pro S’s compact body is also extremely easy to carry and the detachable cable is a nice touch although, the L-shaped connector is definitely a bit out of the ordinary. 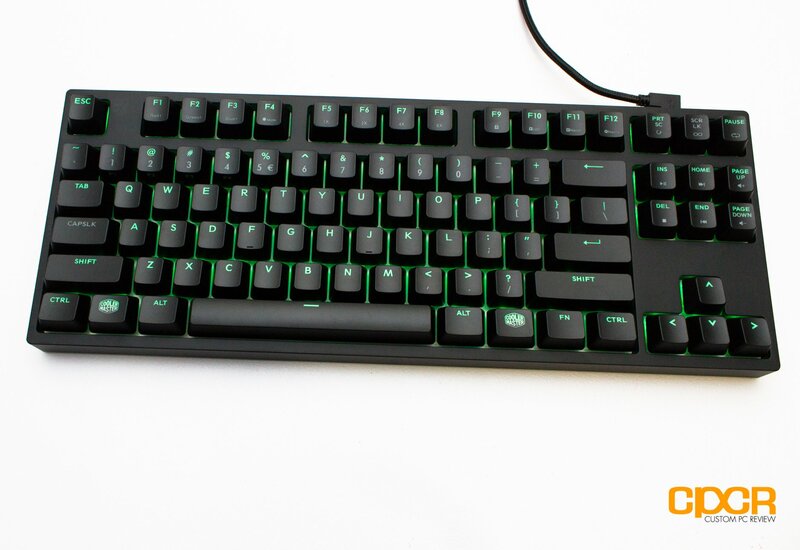 As far as software is concerned, the Masterkeys Pro S has a software utility, but it’s really more a lighting configurator than a fully-fledged keyboard configuration suite like Razer’s Synapse or SteelSeries Engine. All configuration except lighting must be done via key combinations. While this is relatively easy to figure out using the manual, it isn’t nearly as simple as firing up some keyboard configuration software. Of course, the reward for your patience is that all the custom settings are saved directly into the keyboard, never needing a separate software to restore. The biggest compromises you’ll be making with the Masterkeys Pro S is that the keyboard lacks any sort of extra features such as USB pass-through, audio pass through, or dedicated media buttons. 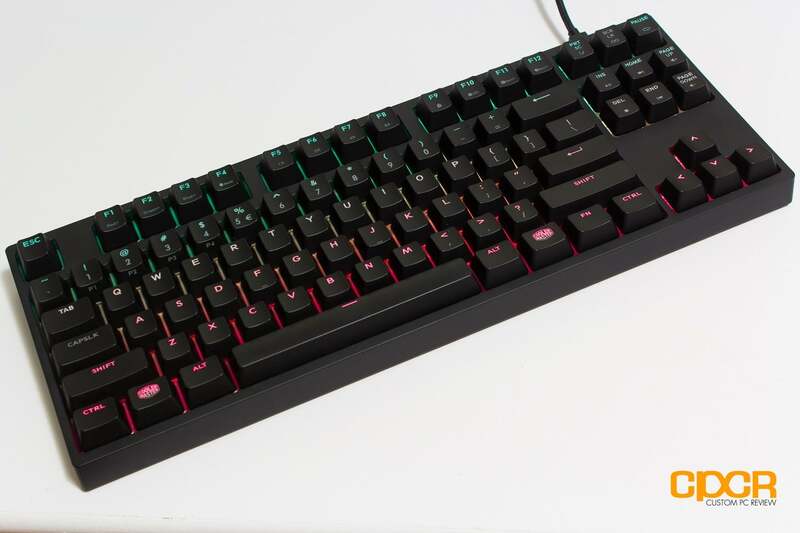 With pricing hovering around the $135 range, the Cooler Master Masterkeys Pro S is smack dab on the industry average for a RGB tenkeyless mechanical gaming keyboard. Overall the Cooler Master Masterkeys Pro S is a fantastic keyboard both inside and out. It’s simple, it’s portable, it’s durable, and you get the all important RGB backlighting. Aside from that, there really isn’t much else that can be said considering its sheer simplicity, but maybe there doesn’t need to be.